VOLCANOS - THE FIRST THREE TYPES! One of the pernicious oversimplifications in elementary geology (even at college level) is that volcanos come in only three varieties: shield volcanos, cinder cones, and composite volcanos. Semantically, this could be right if a volcano is defined as a conical hill or mountain formed by eruption of molten lava. However, molten lava can escape the Earth in many other ways, and need not leave a conical hill in its passing. In fact, the largest and most violent eruptions (including those that influence climate the most) do not form conical hills, and are basically ignored by most textbooks. Our presenters Jayne Aubele and Larry Crumpler have compiled a non-specialists guide to volcano types in New Mexico (click here), and several other types are not found in New Mexico. Here are images of the volcano types we met in The Great Desert, and several other geologically important types that we didn't. This small shield volcano is part of the San Filipe volcanic field. We saw it from the desert soil site and overlook. 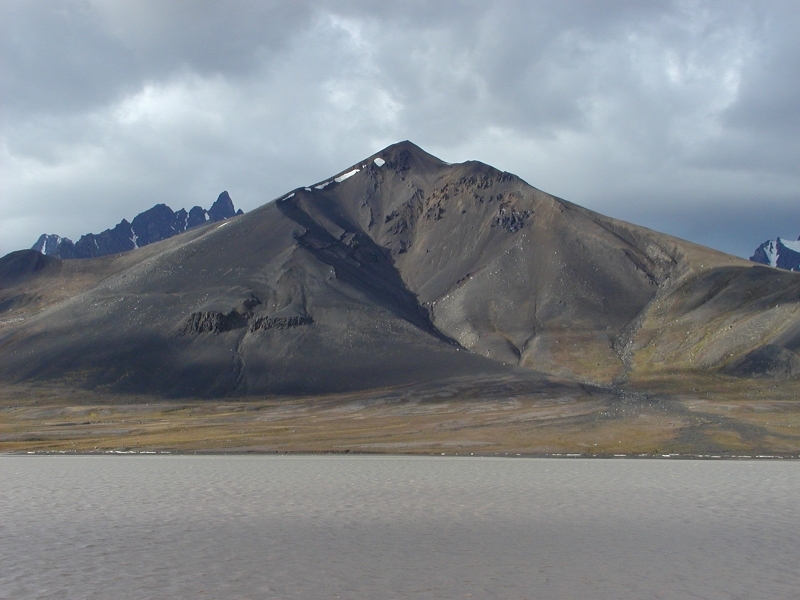 This has the typical shape for a shield volcano -- broad compared to its height (< 5 degrees). Credit. The Newberry Crater shield volcano, near Bend Oregon. 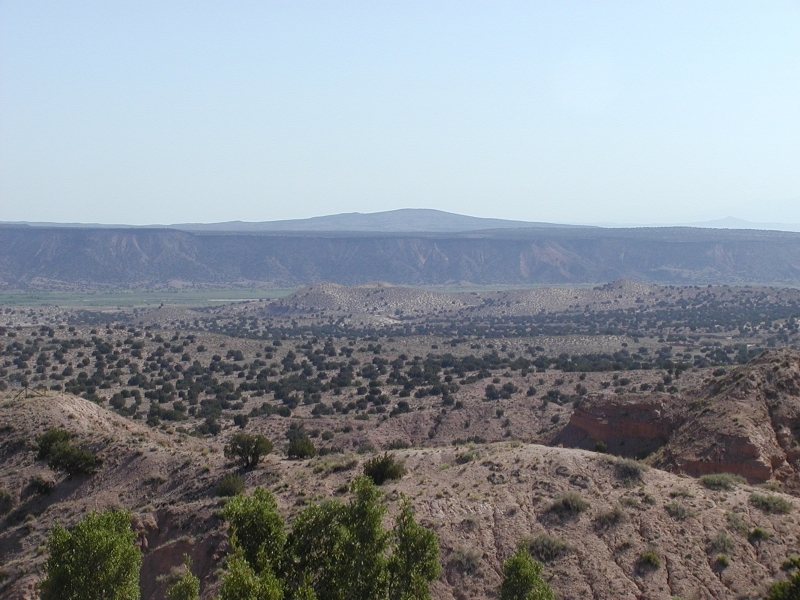 This panorama shows the broad, low slopes of this basalt shield volcano as the horizon. 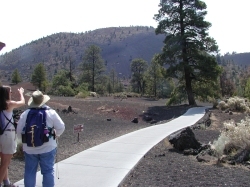 It is dotted with many cinder cone volcanos, which provide its bumpiness. 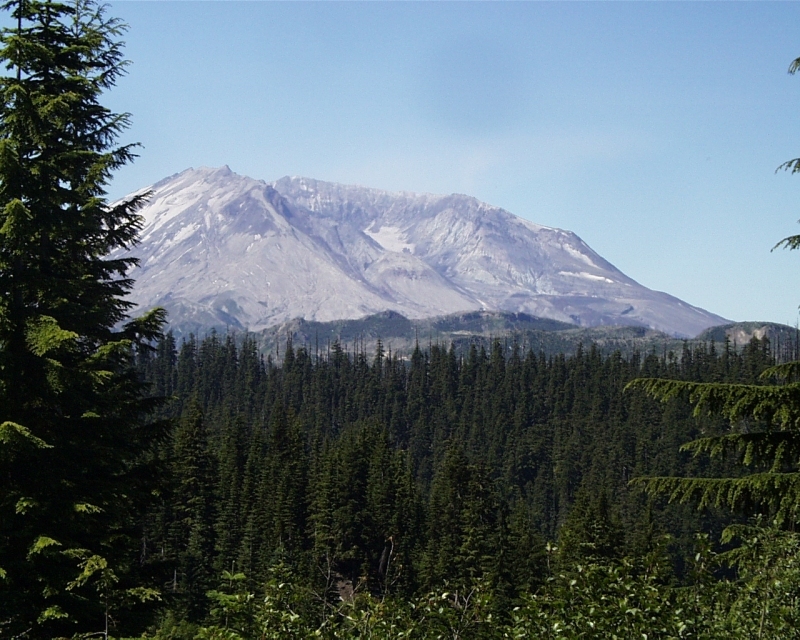 Images from a previous LPI teacher training workshop to the Cascade Mountains volcanos. Credit. Sunset Crater cinder cone is about 350 meters tall and about 1500 meters across the base. Its slopes are which is much steeper than a shield volcano. Cinder cones are mostly loose fragments of solidified lava (cinders) in a big heap. They erupted from a vents near the center of the cone, which usually has a crater at the top where the cinders were blown out. 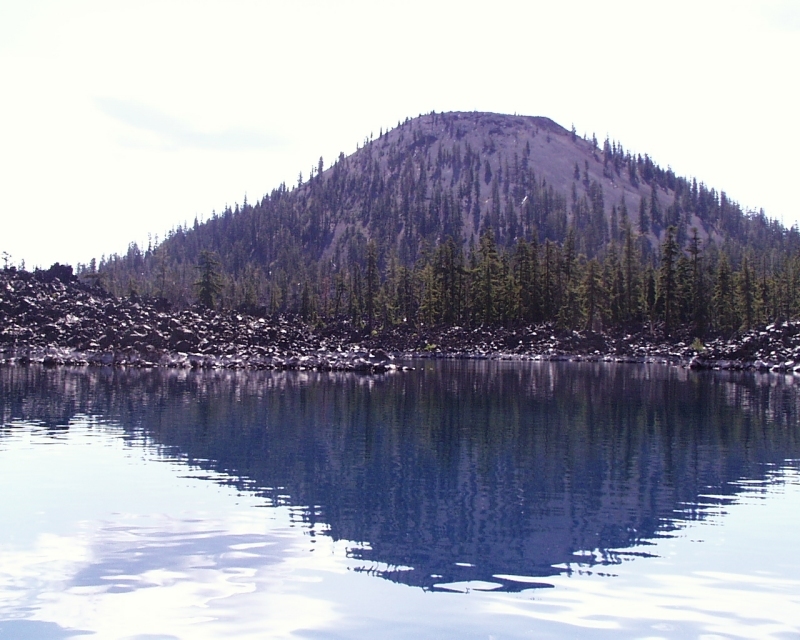 Most cinder cones also have lava flows that issued from the same vents, like the Bonito flow in the foreground here. Credit. Wizard island cinder cone, inside Crater Lake, Oregon. This is a relatively young cone, only a few thousand years old. The shape, slope of the sides, flat top (marking the crater) and associated basalt flow are all typical of cinder cones on Earth and on Mars. Image from a previous LPI teacher training workshop to the Cascade Mountains volcanos. Credit. Here's another from Treiman's recent expedition to Spitsbergen Island, Norway.Credit. 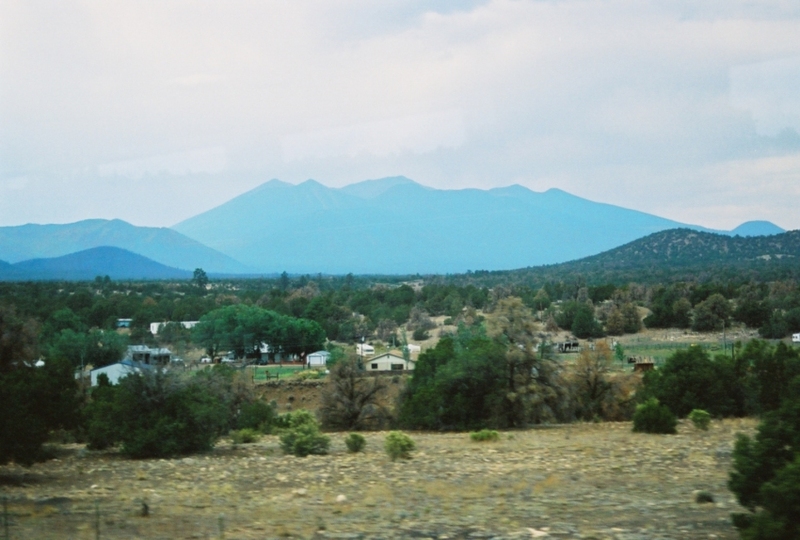 San Francisco Peak, a composite volcano (or stratovolcano) above Flagstaff AZ, seen the south. Like this, composite volcanos generally have steep sides like a cinder cone, but are much, much larger. They commonly collapse or explode at the top, giving them a bowl for a crater and a arc of summit peaks. Image c/o Cliff Fenton. 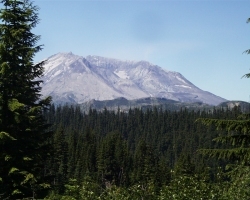 Mount Saint Helens, in Washington state. A classic composite or stratovolcano, which erupted and blew out its side in 1980. This view is toward the blast hole. Again, note the steep flanks and its imposing size. From our 2001 Teacher Training workshop, credit. Back to "The Great Desert"